I sat back in my seat and stared fitfully at the ceiling. I had long ago come to the realization that this job was slowly eating out my soul from the inside. Still, here I sat preparing for yet another day. “Meh, it’s a living.” I said and reached for my mouse, intent on slogging through today’s predictable pile of overnight email. “Whaton earth?” I stepped to the door of my office to find out what was going on. I was first exposed to Good to Great some years back. At that time I thought it was anything but great. I didn’t read the book then, but my experience with it so colored my perceptions that for a while there, Collins was in my lexicon of four letter words. A VP had been brought in to lead my organization. He hit the ground running and held up GTG as his guide book for how he was going to improve the organization. One of those “improvements” led to my being laid off with a large number of my fellow co-workers. Needless to say, my opinion of the book was pretty low and I hadn’t even read it. Years later and with the perspective of time I approached this book again and set out to read it. Doing so helped to codify my position on management and my own personal direction. I came to see my previous brush with Good to Great as being one of the best things that ever happened to me. You see, I got thrown off the bus. At the time, I thought this was the worst thing in the world. I thought the VP didn’t have a clue and he was just making his own little crony club. It took reading GTG to finally realize that he did have a clue, and it really didn’t matter what happened in that job or what that VP did. I had been on the wrong bus! I’m getting ahead of myself. Well more I’m pontificating and not reviewing. Why do some companies make the leap to being one of those companies we dream about being at and why do some companies become “Acme, oh I remember them, they used to be big in widgets?” That’s what Jim Collins and his research staff set out to determine. Collins had already delved into the mechanics of how visionary companies lasts, in his book Built to Last, now it was time to see where those visionaries came from. Collins walks through a six step analysis of GTG companies, building on each previous step as he goes. You can’t get from A to F without starting at A. Level 5 Leadership: This scale does not go to 6. Collins explains the levels of leadership and why you need a level 5 leader to go great. First who… Then What: Probably the most profound section for me. This one will speak to agilists as it is about building the right team, then building the company. Confront the Brutal Facts: I’m the gorilla talker, I’m all about talking to the obvious and dealing with it. GTG companies have to do this to succeed. Collins explains it all. Hedgehog Concept: Hedge what? Seriously you have to read the book, you have to understand why you do what it is you do best. A Culture of Discipline: Can you say accountability? I knew you could. Technology Acceleration: No, this is not how Twitter will change the world. This is more about the basic mindset of technology in the work place. And he ties all that up into his Flywheel of doom.. No wait, the Flywheel and the Doom Loop. The book is laid out in a conversational style, with Collins walking you through each chapter and each thought process. One could almost envision him standing in front of the class and giving one of those professor lectures we all actually liked to listen to. You know, the ones that got to a point and you could follow? The books is only 210 pages long, with another fifty pages of explanatory appendix and a bibliography that would choke the world hot dog eating champion. Data, data, data- This book is not based on theory and hokum. It’s based on hard research by Collins and a dedicated (perhaps crazy) twenty person research team. They piled through mountains of financial data, company reports, news clippings and conducted many interviews in the quest to create this book. When Collins declares a hypothesis, it is one based on mountains of research. Sit on down for a chat- As mentioned in the summary, the book has a comfortable conversation style. Like Collins just sat down and talked about the book with the tape recorder on (I know, I’m dating myself) and then that was transcribed to text. It made the book very approachable and welcoming to read. The right bus- I don’t know if Collins ever intended the book to serve this purpose but I recommend this book to people who I can see are floundering in their personal careers or are stuck in dead-end jobs. CEOs read this book to find out how to make their companies great. Normal people read this book to realize that the bus analogy goes both ways. In a nutshell, one of the six components of a GTG company is “First who… then what.” He uses an analogy of getting the people you need on the bus and getting the people you don’t need, off the bus. Build a great team and the company will be great. Now first of all I’d like to point over at my passion of agile management and how agile focuses on the team, not the project. Then I want to point out that the bus goes both ways. When I was kicked off the bus, I went on to discover that I’d been on the wrong bus. I got the kick in the pants that led to meeting Hogarth and waking up to smell reality. This book isn’t just a good company guidebook, it’s a good personal guidebook. You can learn how to look at a company and decide if you should really keep clocking in or if it is time to find your real career. Time is no friend to companies- When two of the companies featured are Circuit City and Fannie Mae, it can be hard to keep reading. Published in 2001, the book is a definite look back in time. Bank of America could do no wrong in the nineties. Today, we have 99%ers pitching tents in its lobby. While the facts used can’t be argued with, I had to wonder at the connection between Great companies and companies that last. Is it sustainable to be Great or not? Perhaps the answer lies in Built to Last, which I’ve yet to read. One of the ways I measure a books value is where I put it when I’m done with it, the book shelf index. GTG gets the best shelf space, sitting on my desk at work next to the Peter Drucker. Laid out with strong headers and valuable data makes it still a go to reference book in my day to day work. In the end I found this book useful for reasons Collins may not have envisioned for the book. Yes, companies can use this as a guidebook for going in the great direction. And the individual worker can use it to determine if they are in the right company for them. As much a personal development guidebook as it is a company development road map. The Failed Gorilla: Just because you failed doesn’t mean you didn’t succeed. It was like rearranging deck chairs on the Titanic. No matter how many times I moved the boxes around, the data still showed the damning truth. Failure. The project was a failure and there was no amount of lipstick I could slap on it to make it anything else. The executive review was going to be painful. “FORE!” A golf ball whizzed past my head and shot out the open window. All but picking myself up off the floor I shot a look out my open door. Cheerfully striding down the hallway was Hogarth, wearing the most ridiculous golfing outfit I’d ever seen in my life. All right, the outfit wasn’t so bad, but on Hogarth it was awful. I buried my head in my hands. “Hogarth,” I muttered from the depths of my palms. “There isn’t going to be a launch party. “Maybe I’m dense, I mean I’m just a gorilla, but isn’t shipping to the customer a definition of success. There are dozens of stories about the stunning percentage of projects that fail. And yet we still do projects. You’d think with ratios upwards of 80% project failure that whole departments would be getting shot on a daily basis and a lot more companies would be going under every week than actually do. So why doesn’t this failure have a greater impact. Just because you failed, doesn’t mean you didn’t succeed. Just because a feature is broken, doesn’t mean it doesn’t work. So tied are we to the infamous Iron Triangle of Cost, Schedule, and Scope, that we often lose sight of two of the most important things. Are we delivering value to the customer? Are we delivering value to the business? Whether you use Agile in your development process or not the value of communicating with your customers just can’t be overlooked. When you communicate and communicate often, you will find the needs of customer shifting. This can drive many folks mad, as they try and keep features locked down and fixed. But at the end of the day we are selling the product to the customer. If we build it exactly to the original specifications and that doesn’t meet the customer’s needs, then you’ve got a real failure. What’s a bigger failure? Being three months late, but the customer is happy. Or being on time and the customer doesn’t want the product? Make sure you are in touch with your customers, internal and external and don’t let the Iron Triangle sink you to the pits of despair. How is a Gorilla Project Manager like R2-D2? See, this is why I hate dinner parties. Now if I was a doctor, a pilot, heck even a mechanic, it would be easy. I’d just say it and we’d move on to the meaningless small talk portion of the evening. But no… I had to decide to become a project manager, even worse an agile project manager. With a deep internal sigh I sized up the person who had just asked me the question. Neil was nice enough, but I could already tell it was going to be an uphill battle. He was the neighbor of the host who was a friend of my wife’s. I already knew Neil was in Real Estate (he’d left a stack of his business cards in the bathroom), I didn’t relish the next few moments. Neil cocked his head to the side. The look of confusion on his face was all too familiar. Taking a breath I tried to explain. I don’t know why I did. It’s not like I’d ever had any success before. And yes, I’ve tried the “I heard cats for a living.” I really didn’t want to be asked what circus I worked for again. “Oh, so you’re a manager?” Neil asked. Of course what he was really asking was if I was in charge of people. Why is it that a measure of your worth is how many people call you boss? I wasn’t even going to try and explain how agile project managers were more like coaches. Not being a sports fan myself I didn’t want the conversation to go down the rat hole of how I thought the local pro sports teams would do this season. Just then I spotted a dark shape duck around the side of the house. Hiding a groan I excused myself from Neil and left the smell of BBQ cooking on the patio behind me. Coming around the corner of the building I found what I feared most. 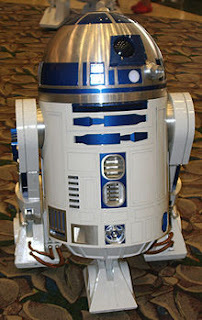 R2-D2 – Robot side kick to the Skywalker’s of Star Wars and Agile Project Manager: He’s not the hero of the show and he’s never been a leader, but it would be hard to imagine the Star Wars universe without this plucky little trashcan on wheels. But what does R2 have to do with being project manager? Everything! R2 is the ultimate Agile Project Manager. Or perhaps we project managers are the ultimate R2 Astromech droids. R2-D2 knew all about responsibility without authority: Princess Leia, his project sponsor, assigned him the project but gave him no resources to do it with. He even had to track down the product owner for more information. He enlisted C3PO on the force of their relationship alone. As the project progressed he collected more resources on influence or by working with his project team. R2-D2 understood that project requirements change: When his sponsor first gave him the project it was very simple, get this message to Obi Wan Kenobi (his product owner) so that Kenobi could stop the Death Star. But he knew the requirements would change. He didn’t demand a full list of requirements before he headed for the escape pod. He was confident that future backlog grooming would reveal more requirements. He also knew that iteration planning would break the epic scale user stories down into smaller stories and tasks. So he started the first sprint with just a couple of user stories. Engage existing resources. Get off the Ship. Don’t get shot. R2-D2 knew how to motivate his teams: When R2 met Luke Skywalker, he knew who the boy was. He leveraged past project retrospectives for that (Okay, he was in the first three movies). So with that in mind do we really think he accidentally showed Luke the holo of the princess? Heck no! He remembered that Obi Wan told Senator Bail Organa he would watch over the boy. So by revealing the holo, not only would he possibly find a clue to where his product owner (Kenobi) was, but also could motivate the young man to help the project. R2-D2 knew his job was to guide the use of proper process, but also knew that sometimes you trust your team: Process said you used a targeting computer when firing a proton torpedo. But he chose to trust his team member, Luke, when he turned off the computer. Good thing he didn’t stick to rigid process enforcement, right? R2-D2 knew all about removing impediments: Shut down the trash compactor. Fix the hyper-drive. Stop the elevator from falling. Shift power to the rear deflector shields. Open this door. Put C3PO’s head back on. Put C3PO’s head back on, again. When his project team encountered an impediment he jumped right in and owned clearing that impediment. R2-D2 was the ultimate servant leader: R2 knew exactly what needed to happen. After all, he’d been working on related projects since the Phantom Menace. By the time it came time to destroy the Death Star, good old R2 knew all the players. He could have told Luke that Vader was his dad on the first day they met. But he didn’t. He knew he had to let his team member discover some things himself. Instead he carefully guided his team member on the path. He was never the hero, but he always saved the day. He worked quietly and tirelessly in the background to ensure all went well. Emperor Palpatine may not have known who he was, but his team did and they appreciated him for his efforts. So you see, the next time someone asks you what you do for a living. Stand up proud and declare.